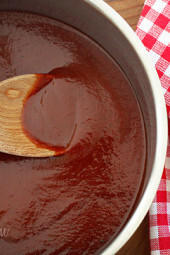 Sweet and spicy Kansas City style BBQ sauce made with tomato sauce, honey, molasses, vinegar and spices. It’s so easy to make, simply combine all the ingredients and simmer on the stove for less than 30 minutes and what you end up with is a thick, tangy sauce with the perfect balance of sweet and spice; perfect on chicken, pork or beef. What I like about making my own sauce is that I can control what goes into it whether it’s the amount of heat or sugar. You’d be surprised to learn that most BBQ sauces sold in the supermarket contain high fructose corn syrup. Did you know most brands of ketchup also contain HFCS too? Don’t worry, I’m working on a ketchup recipe soon! In a large saucepan combine all the ingredients and simmer over low heat for 25 minutes stirring occasionally. Let it cool and store in the refrigerator until ready to use. For using on grilled meat, brush onto chicken, pork or beef the last 10 minutes of cooking. Someone suggested using an ice cube tray to freeze portions of bbq sauce. Is there any reason it wouldn’t be advisable with this recipe? Has anyone tried freezing this? Thank you! I’ve made this multiple times for use with a recipe for crock pot pulled pork. This is a very good barbecue sauce! It’s got some kick, so for those of you that might not want so much heat, don’t put in cayenne. I like it just as it is.It is comparable to what you will find at a good southern BBQ place. How long does it last in the fridge? I have some I made a few months ago but I’m not sure if it’s still good. I’m sorry if I missed this, but wondering how many freestyle points this is? I made it last night and absolutely love it! 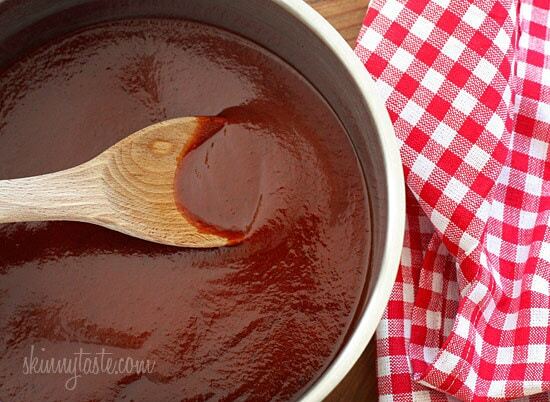 This is simply the best BBQ sauce EVER! Made it exactly as written and I might use a little less cayenne next time…it’s a little spicy but not too much when paired with food. Love this sauce! If I don’t have molasses can I sub more honey or brown sugar? Amazon, or health food store. 40 years ago when I was on WW they had a ketchup recipe that I made. I don’t have the recipe now. I have been making this sauce for years, so obviously I love it. Now I am vegan and I still make it. I simply swap some maple syrup for the honey. I like heat, so I add lots of cayenne and chili powder. Tonight I will be simmering my lentil meatballs in the sauce to serve as an appetizer for our guests. This has become my got to recipe for BBQ sauce. My friend made a huge batch and sent me the recipe and I have been using it ever since. I’ll switch up the flavors and use a mesquite flavor depending on the crowd. Love this!!!! Even if your a beginner it’s super easy to whip up. And people will be so amazed how easy it actually was for you to make it (or play it up. I’m not judging). Very good BBQ Sauce. I substituted equal portions of Honey for the Molasses. Separate and add more cayenne to a portion for some with a kick. Family loved it. Good on pulled pork and trying on ribs today. Sorry meant to say I substituted pure Maple Syrup for Molassis. 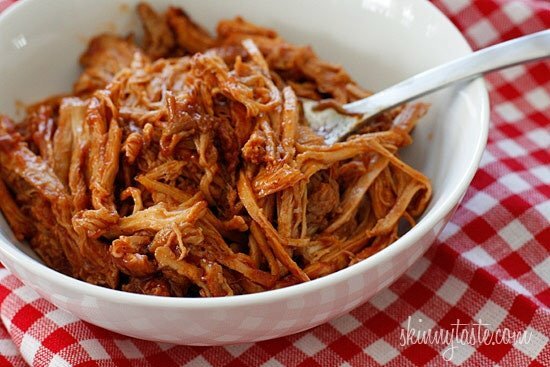 I made this tonight to use for your pulled pork recipe and it was phenomenal! Next time I think I’ll add a less honey because it was just a little sweet for my taste but this recipe is definitely a keeper. The sauce on the pork was perfect! Thank you!! I got 2 smart points on recipe builder, i'm hoping 3 is a typo?? Honestly, it was better just shredded up with it's own juices before the bbq sauce went in. Gina would this work for crockpot ribs? For those of you looking to replace molasas.Dark Karo syrup works well instead. Would it work to parboil my chicken in this sauce before putting it on the grill? I've done that with a different recipe that is also a marinade, and I like to partially cook my chicken before grilling. This is my go-to recipe for BBQ sauce… everyone loves it and asks for the recipe, and I gladly direct them to your site, Gina! Made this tonight and was super happy with the result! I can't believe I made bbq sauce (to go along with your pulled pork recipe). I substituted brown sugar for the molasses because I didn't have molasses, and it turned out fine. For us, I think I'll half the cayenne and black pepper, but that's just a personal preference. Thanks! Do you think maple syrup would work in place of the honey? I've made this many times since you first posted but we gave up honey a few months ago. I love this recipe and really hope I can still make it! Could I can this in my pressure cooker? I've just finished making some of this delicious BBQ sauce. I plan on using one cup of it for the Pulled Pork recipe and have some in a small container to brush on my turkey burgers. However, I still have 2 cups left. Can I freeze it? OK…SO YUM!!!! Little too sweet for my buds, so I just added 1/2 more of the required measurements of spices and smoke…and viola..perfection! Also, to thicken up a bit, just add a bit of corn starch, like 1/2 tsp. Thanks Gina..you make clean eating fun! Seriously the best sauce ever. How long do you think leftovers will last in the fridge? This BBQ sauce is awesome! Thank you! I've made other recipes that did not taste that great, but this one is amazing! This is the best BBQ Sauce EVER! Thanks!! When you say "Tomato Sauce", what do you actually mean. I'm an Aussie – do you mean tomato ketchup, marinara sauce, passata or something else? This was much too sweet for my taste. What is the best way to adjust this recipe so that it's less sweet and more like traditional BBQ sauce??? Thank you so much for the recipe. I really had no idea you could make your own BBQ sauce! couple options. If you want more spice, add more cayenne or add some hot sauce/tobasco sauce. If you want to just tone down the sweet flavor, reduce the amount of Molasses a LITTLE. It's super sweet so I would say add maybe half the amount and taste and add a little at a time from there. The honey is much milder in flavor than the molasses but i'm sure that could be adjusted too. I really like this barbeque sauce. I make it whenever I have pulled pork. I do leave the liquid smoke out though because I don't like the taste of that. Just finished making this and it is AMAZING! It has a nice kick at the end 🙂 Thanks for another amazing recipe! Do you think I could substitute the red wine vingegar with rice vinegar or white wine vinegar? I have red cooking wine, but not red wine vinegar. Any suggestions? I just made this tonight and it is amazing! Can i use bone in country style ribs, if pork tenderloin? You are a godess Gina! Thank you. This recipe is the best sauce ever! I don't know if you're still answering questions about this or not, but I have all ingredients on hand except molasses. Could I substitute something? BEST. BBQ Sauce. EVER. I may never buy a bottle of sauce again. OMG – I just made this in preparation for the mini bbq turkey meat loaves with bacon. This is amazing. I don't think I ever need to buy another bbq sauce ever again. And to save time for the next batch I measured out all the dry ingredients and put it in a little container so it is ready to go. All I need to do from there is mix the the canned and liquid ingrediants, add in the already measured out spices and I'll be good to go. Can't wait to see how the turkey meat loafs turn out – I am sure they will be yummy! 3/4 of a cup (which is the small 6 fl. oz can) of tomato paste plus 1 cup of water can be substituted for 2 cups of tomato sauce according to my Better Homes and Gardens cook book. I would mix this and then measure out 1 and 1/3 cups or even a little less. I don't think it has to be exact. I hope that makes sense (what you mix up will be 1 and 3/4 cups but it is the equivalent of 2 cups of tomato sauce). My sauce just finished! Think I put just a tad too much tomato sauce in. Any ideas on what to add more of to lessen the tomato flavor? My boyfriend picked this sauce over Sweet Baby Rays! Soooo good! (And no HFCS!) Perfect amount of spicy and sweet. Thanks for the great recipe! I don't want to cut out the honey (luv it). But don't have molasses. Can you use agave in place of the molasses ? This is amazing. I just made it and couldn't be happier with the end result. Thank you! Gina, I just tried this sauce, and it turned out amazingly well! I am a Kansas City native and BBQ lover, and it was everything I expected and more. My natural foods market didn't have all-natural liquid smoke, but they did have a smoke salt. I ended up grinding it down a little finer, but it was really a great substitute. Thanks again! We are on the Paleo diet in our house- would leaving out or using much less honey and molasses really mes this recipe up? It needs the sweetness, what if you cut it back by half and added stevia? I made this last night. Had a little taste and it was great. We are having the pulled pork tonight! Love your recipes! I'm sorry, I'm stuck on the tomato sauce thing too. I'm Australian and what we call tomato sauce is essentially the same as ketchup in the US (so won't be able to find it labeled as 'tomato sauce' in the supermarket). Are you able to describe it any further (eg. a mix of tomato paste and tomato puree)? I'm so keen to try this! Yes, that sounds about right. Thanks for answering. You could probably replace the honey with Splenda. I just made this sauce and OMG! That is all that i can say! I am simply in heaven as this is to die for! I can't wait to add it to the pork loin that I have in the crockpot for the pulled pork recipe! Thank you so much for this awesome recipe! You'll want to measure and add red wine vinegar twice. Measure 1/2 cup of red wine vinegar and add it to pot. Then Measure another 3 tablespoons red wine vinegar and add it in as well. Hi Gina – or anyone who has made this, can I please have more direction on the tomato sauce…can I use pureed tomatoes? Or when you say small can do you mean a small can of spaghetti sauce? Not spaghetti sauce. In the same aisle as the spaghetti sauce and puréed tomatoes, you will find cans that literally say "tomato sauce" ie Contadina makes one. If you get the small can (8 ounce), you will need two. Thanks for another winning recipe – my husband thanks you too! At least a week if not longer. Gina! I religiously check your blog every morning when the smokers at my office take their first break. I was so excited for this as I had pork in the crock pot for dinner tonight! It was a great addition to our meal and my husband has strengthened faith in my kitchen skills! Would agave work better glycemically?????? Yes, agave would have a lower GI value. Yep, it's just about time to get the smoker out. Pulled pork is my favorite food of all time. I will make this sauce tonight so as soon as the pulled pork recipe is out I can make that. You have certainly brought a smile to my face today!! Can the liquid smoke be omitted without a drastic change to the taste? I don't care for it but my husband loves it (I see a compromise in our future). why not use half? I think it needs it. You had me at "liquid smoke"… YUM. And WAY less points than normal bbq sauce!! Excited to try this out…. being a kansas girl born and bred, I'll let you know what I think after I test it out! I'm another KC native so I can't wait to try this. The best sauce here used HFCS. Ick. By the way, Hunts now makes ketchup without HFCS. I have seen it at all the regular grocery stores and usually buy it at SuoerTarget. I found an organic Heinz ketchup yesterday at the health food store that only uses organic sugar. I'm so happy! Sound dumb; what is HFCS? Never a dumb question.. The evil High Fructose Corn Syrup. Also, Heinz makes "Simply Heinz" and it doesn't have HFCS either! Would you be able to use this for BBQ Chicken Pizza? OK – this may sound dumb – but what do you mean by tomato sauce – do you mean tomato ketchup or something more like passate (seived tomato)? Tomato sauce that comes in the small can, not ketchup. Mmmmmm can't wait for the pulled pork recipe, perfect timing because I have grocery shopping to do tomorrow! Is this gonna be a thick and sticky type of sauce? Soon as I saw that this was KC Style BBQ sauce, I couldn't resist coming by to see it! I'm from there originally and was thinking I need to try making a bbq sauce at home so I can control the ingredients. Will be adding this to my bbq list for warmer months! OK, can I play dumb…what does unsulfered mean? 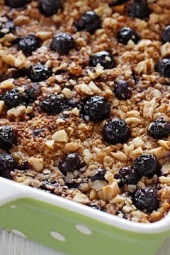 Yum….. cannot wait to make this….. I have a pork shoulder and wanted to crock it and this sauce will be PERFECT! As always – thank you! *sigh* I wish you'd have read my mind yesterday! I just read every label in the store and found TWO brands of barbeque sauce that didn't have HFCS. 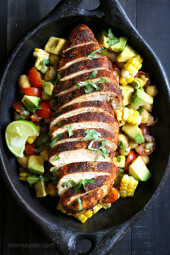 If I hadn't have bought some, I'd be making this over the weekend for the chicken I intend to barbeque in the oven. I am from Texas, and we like our sauce on the vinegar-y side, but this (and the store bought stuff) should work in a pinch. I need to scale down my dad's sauce recipe. I'm so excited to try this sauce!! I was just thinking about doing pulled BBQ chicken this week! But I do second this Gina– any chance you might consider tweaking it to have a Texas style sauce? OR advice on how that might work? Thanks for all your fantastic recipes! Bullseye doesn't use HFCS. I'm not sure if they have a vinegary flavor, though. I'll have to play around with a Texas version soon. This looks awesome, definitely going to try out this weekend! Where did you buy all natural hickory liquid smoke? It's in the same area as the BBQ sauces. what is liquid smoke and where can you buy that? thank you! this is going to be amazing! Liquid smoke is a dark liquid that has a wood smoked flavor to it. You should be able to find it in any grocery store. It's a smalle bottle usually around the bbq sauces or worschetshire. I use it all the time. I add it to my sauce for meatloaf, bbq baked beans, marinades for steak etc… Go easy with it, depending on how much smokey flavor you like, a little can go a long way. This is AWESOME!! I just used the last of our store bought BBQ sauce (on the amazing Crock Pot Kalua Pork!! 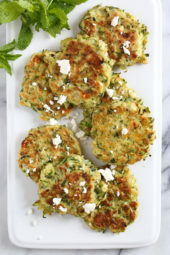 ), and had thought to do a search here on Skinnytaste to see if I could find a recipe….and here it is! Yay! Thank you very much! What cut of beef would be ideal if I wanted to make "pulled beef?" I would use flank steak. Flank steak? Can you put it in the Crock Pot? Another beef that is terrific for the slow cooking is a brisket! Sure, you can put it in the crock pot with water, add some onions, carrots and let it simmer all day, then shred. How long would it keep in the refrigerator? Is it something you could make a batch of and use until it's gone? I've kept it in the refrigerator for weeks and it was fine, but I'm not sure so I don't want to say they wrong thing. Gina, I threw out my liquid smoke years ago when I learned it was essentially liquid carcinogen, no thanks!! But I miss the flavor in my homemade ribs and now I see them in your bbq as "all natural liquid smoke" and my ears perked up!! Where can I get that and is it truly all natural?? Thanks so much, can't wait to try this sauce recipe! Liquid smoke is actually liquid smoke. There's nothing unnatural about it. It's literally just condensed smoke. The reason it's a carcinogen is that smokey things are actually carcinogenic! That nice burned crust on your chicken.. that crispy toast.. this is the price we pay for tasty things. Actually, many liquid smoke companies filter their product for the carcinogens you were talking about, which makes liquid smoke a lot safer than smoking/barbecuing something yourself. There is a spice company called 'Spice Barn' that produces a dry 'Hickory Smoke Powder' which works well for me when making up breakfast sausage spice mix. Can't wait for your ketchup recipe! Can’t wait for pat to make this. Ketchup is easy. I’m allergic to onion/garlic family so I had to figure it out. Tomato paste, water and cider vinegar, and salt to taste. Water added at the end for consistency. You are about to win me "Best Girlfriend Ever"! Thank you!